In this part you will learn how to control data flows within the Trusted Connector using LUCON policies. LUCON (Logic based Usage CONtrol) is a policy language for controlling data flows between endpoints. The Trusted Connector uses Apache Camel to route messages between services (such as MQTT, REST, or OPC-UA endpoints). The ways how messages may be processed and passed around between services is controlled by LUCON, a simple policy language for message labeling and taint tracking. 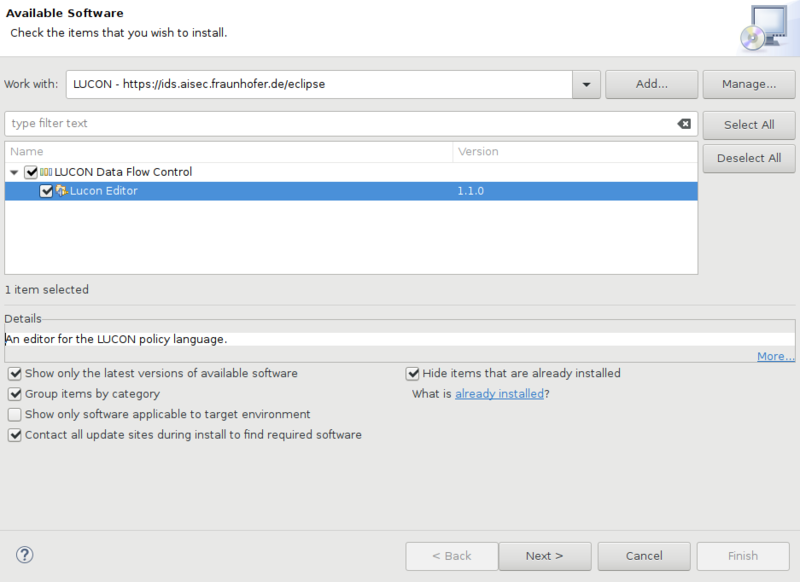 Write a LUCON policy in Eclipse (Install Eclipse Plugin). As you type, Eclipse compiles the policy into a .pl (Prolog) file in the compiled-policies folder. Consider the following example rules. description "Do not leak personal or internal data"
In this example, a rule anonymized declares that if any service matching the publicEndpoint description receives a message that contains a label personal or a label internal, the message has to be dropped. description "Deletes all hadoop data after 30 days"
In this example, a rule deleteAfterOneMonth declares that all messages (indicated by receives *) sent into a service matching the hadoopCluster description must be deleted after 30 days. If the service does not support deletion, the message must be dropped. id (required) A unique identifier to which any flow_rule may refer to. description (optional) A string describing the purpose of the rule. It is just for information and has no effect on the policy. The first example defines a service that can blind the fields “surname” and “name” and thus removes the label personal. Messages that pass this service, will not be dropped by rule anonymized. // Defines the Camel endpoints for which this service description applies, using a specific endpoint address. // Properties describe the service's behavior. The second example, matching rule deleteAfterOneMonth defines a set of database services that are able to run a delete_after_days action and add a label persisted to messages. // Defines the Camel endpoints for which this service description applies, using a regular expression. // Everything starting with hdfs:// or sql:// applies. Download any Eclipse installation from the Eclipse web site. 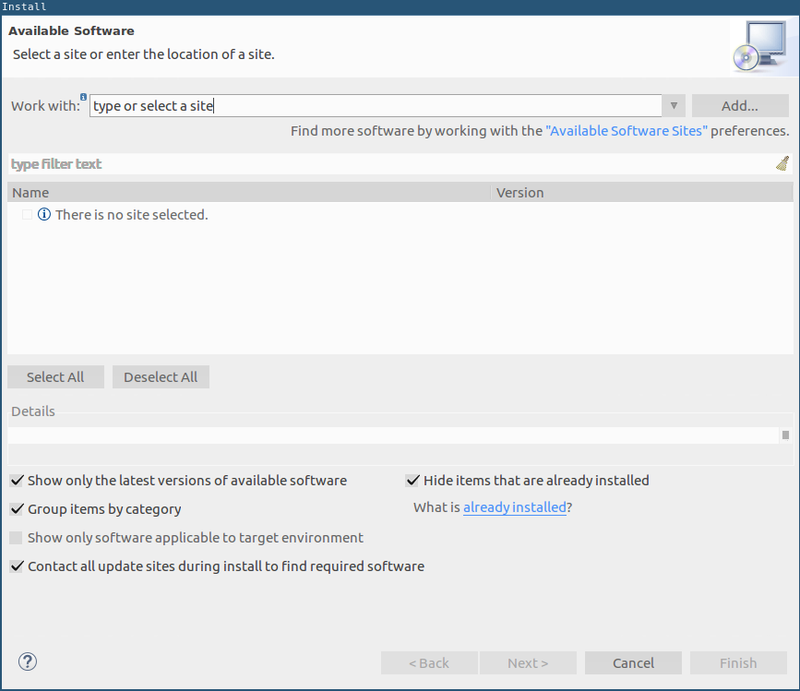 We recommend using the Eclipse Installer. Click on Add… and enter the LUCON update site URL: https://ids.aisec.fraunhofer.de/eclipse. Select and install the LUCON Policy Editor feature. In Eclipse, create a new project and open a new file demo.lucon. By default, all messages will be blocked, so we create a policy that allows publication of a message over an HTTP(S)/WebSocket endpoint if the message is marked as public. As only calls to a SanitizerBean will add the public label, the policy guarantees that all messages will flow through that bean which will remove personal data. As you type, Eclipse will create a file demo.pl in the compiled-policies folder. This file contains Prolog predicates representing the compiled policy. It is not necessary to understand or edit those generated files.